80's Overdrive is on course for a release in 2017, and developer Insane Code has released some more gameplay footage which makes this Out Run-style racer look even more impressive. The video contains music from Vectorwolf, a band which has licensed some of its songs to appear in the game - including Night Chase, which is the tune you'll hear in the clip. 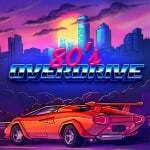 80's Overdrive will showcase "at least" 6 different cars (which can be upgraded), 8 different track themes, two game modes and a course editor - the latter of which will allow players to share their creations with others via special codes. This looks awesome. I am totally going to buy it once it comes out! Fantastic colors the game has! Good looking Polish game on 3DS... what a time to be alive! From that trailer though, this game doesn't seem to offer enough differentiation from what Outrun did 30 years ago. It's just Outrun, with a slightly different colour palette and soundtrack. Looks amazing until you start to turn, when it transpires the car has rear-wheel steering. The CRT effect is awful. I always see like that at my local game center. Is it even going to come out for a Nintendo system? I don't want to be nit-picky, but this looks like a NEO GEO game...which came out in the 90's. Oh...and the car is too big for the track. Who made this game? Titus? Nice; if this actually makes it to the 3DS, I'm in. Wow neat, if the Course Editor is anything like the Amiga's "Jaguar JX220" I will be spending quite a lot of time on it. It sure looks authentic, and thus totally rad from an audio-visual standpoint, but isn't this kind of gameplay a bit outdated and clunky? Chase HQ and OutRun was awesome back in the day in the Arcades. @gcunit That's exactly what I thought as well. I already have Outrun on my 3DS so this game is not worth it. @Dark-Link73 yes I do own the original. Heaps of fun. @retro_player_22 it's coming to the 3DS eshop. I wonder if it will be available on anything else. Sure looks good. It has a better look to it than Sega's own scaler-based follow ups to the original. I'm a big Out Run fan, so I'd be happy with more of the same with new tracks/courses. I'd recommend starting with the original Out Run, but this could be great for those wanting more of it. I'll be interested to see how their tweaks, like car upgrades and, apparently, police chases, affect the game. More background paralax scrolling is never enough to make things look gorgeous! Looks great I just hope it's not a new Nintendo 3ds game and works on the old 3ds! @sdelfin Thanks, I was hoping it doesn't end up like the 90s Racing game where it just kinda got canned. @NinChocolate according to the developer page, there are police chases. Not sure how that works exactly. Sounds like it's a reverse Chase HQ. But it might just have the trick you'd like to see. Maybe you can be the police too and it could be an Out Run clone and Chase HQ clone at the same time. That could be really cool. Looks like Outrun on steroids. I showed my 18 month old son this video. He clapped and say yay car! I didn't appreciate the frequent wobbling of the gameplay footage in an exaggerated attempt to simulate the old-skool crappiness of VHS tapes...but I did appreciate the everything else. Oh man, I'm excited for this! I may be in the minority here, but I love that there are still people making old-school games like this. A lot of people seem to think that graphics/gameplay like this are outdated but IMO games like this look/play better than at least half of the games from the past 15 years. I do not mind if a game looks old, but I want a 3D camera view on a racing game nowaday. It is fine if the objects are not rendered 3D though. They went for the throwback 80s feel and it looks like they nailed it. Get a good review and I'm in! This game definitely needs Tokyo Rose's songs in it. Not the punk pop band, but the Synth band. I'm so buying this the moment it launches. Sweet! I wish Nintendo made retro style games. @sdelfin oh that'd be great. It looks like a spiritual successor to Top Gear on SNES. I'm interested. Am I the only one disappointed at the video footage? It looked extremely cramped on the screen and the transitions into turns are terrible. Sorry, but this looked far better in stills than in motion. @crimsontadpoles Thank you !! , you should check us out on soundcloud .